With all of their settings, functions, buttons, racks, and whatnot toaster ovens can be confusing. The good news is there are only 3 settings you need to know to get dinner on the table or a fresh-baked cookie in your hand. So grab a cup of coffee, friend and let’s chat about your basic toaster oven settings. The most important thing you need to know about cooking with a toaster oven is that the settings control the heating elements inside your toaster oven. If you have a digital toaster oven, each setting may also provide a preset or suggested cooking time for specific items like cookies or toast. *It’s important to note that the presets do not know exactly what you are cooking. If you select the “Cookies” setting, your toaster oven doesn’t know if you’re making mini chocolate chip cookies or giant sandwich-sized ones. Just like with a traditional oven you (and your good judgment) are still very much a part of the toaster oven cooking process. 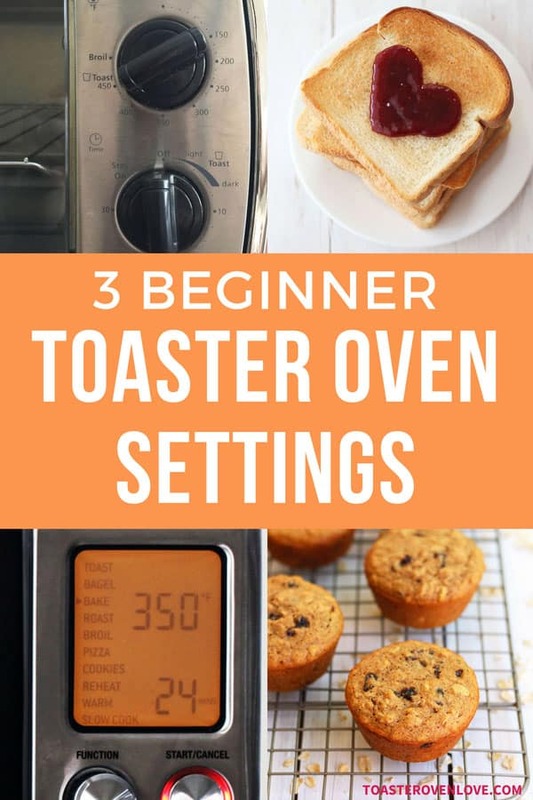 There are only 3 settings you need to know when you’re getting started with your toaster oven – Bake, Broil, and Toast! This is the setting you’ll likely use the most. It’s similar to a traditional oven with the heat coming primarily from the bottom elements. In the bake setting your toaster oven will cycle or pulse the top and bottom elements off and on to vary their intensity and help your little oven maintain an even temperature. Your toaster oven will preheat quicker. Depending on the size, it will preheat 30% to 50% faster than a traditional oven. Your toaster oven will usually bake faster. Until you get used to baking with your toaster oven, begin checking on your dishes about 5 to 10 minutes earlier than the shortest cook time listed on your recipe. Most toaster ovens have hot spots or areas that are warmer than others. To even out browning and baking, rotate your pan halfway through the bake time. 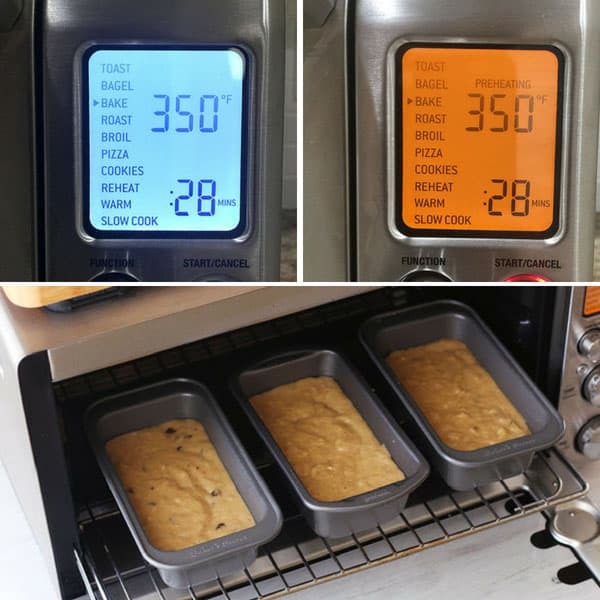 To give you an idea of how using the Bake setting works, below are basic instructions for the Breville Smart Oven Pro. For directions on using your specific toaster oven, please refer to your manual. Once the toaster oven indicates it’s preheated, place your pan inside, close the door, double check that the timer has started (adjust the timing as necessary) and begin cooking. If your toaster oven is not digital, you’ll want to preheat it for at least 5 minutes before adding your pan. Remember to reset the timer for the full cooking time after preheating. For help with convection baking check out this post on Everything You Need to Know About Convection Toaster Ovens. Broiling is a lot like grilling in that the heat is coming from one direction. With the broil setting your toaster oven uses direct radiant heat from only the top elements. 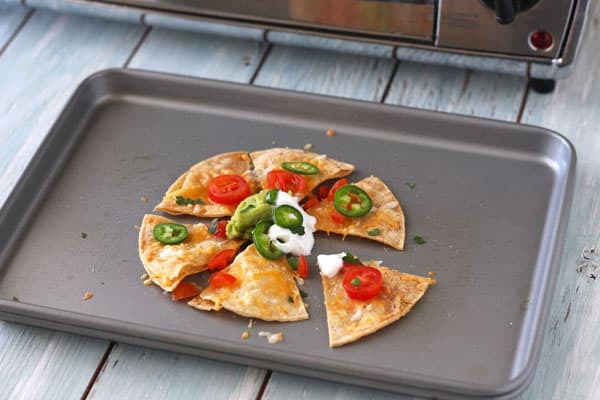 Broiling is great for melting cheese on a batch of nachos for one, roasting red peppers, making indoor s’mores, or quickly cooking thinner slices of vegetables like eggplant or zucchini. Tim and I don’t eat meat but I hear it’s pretty popular for steak and seafood too. Below are some basic tips for using the Broil setting, please refer to your manual for directions on your specific toaster oven. Most toaster ovens do not have you preheat with the Broil setting. Generally, you’ll want to use the top rack placement. Always use a broiler-safe pan, if you’re not sure just use the pan that came with your toaster oven. The heat is only from one direction. If you want to cook or brown both sides of an item, make sure to flip it. Use caution when grabbing pans that have been broiled, they will be extremely hot. If you find you’re burning food with this setting, adjust the rack height to a lower position. If your toaster oven has an adjustable broiler, play around with adjusting the temperature (500°F, 400°F, 300°F) or intensity of the heat (High, Medium, Low). I won’t sugarcoat it. Toaster ovens do not make the best toast. At least, I’ve yet to use a toaster oven that made toast as well as a stand-alone toaster. 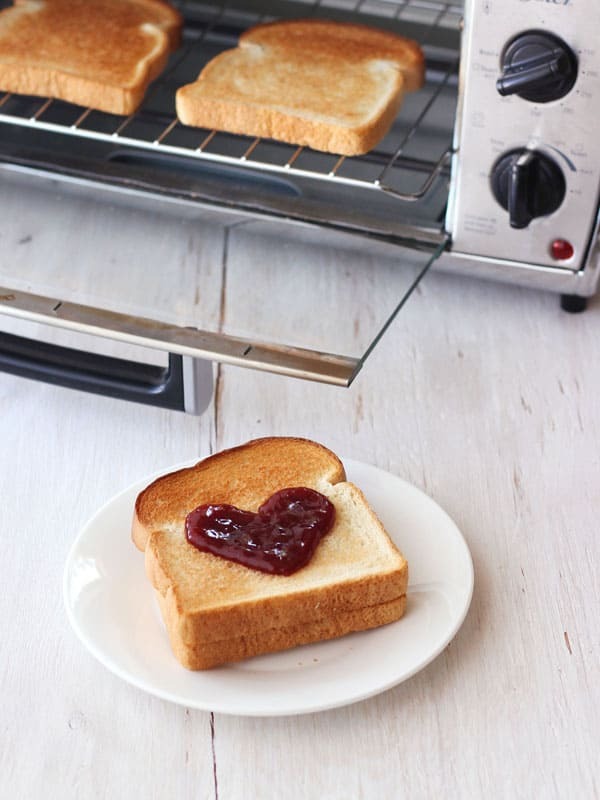 That said, our little ovens toast good-enough for us. As you’ll see below, the Toast setting is a bit more nuanced than the other settings. Heating: With the toast setting, both the upper and lower elements are distributing an equal amount of heat. Temperature: On a toaster oven with knobs or dial controls the intensity of the heating is set by using the temperature dial. While digital toaster ovens usually have a pre-programmed high temperature that is not displayed. Rack Position: Some toaster ovens suggest the top rack placement while others stick strictly to the middle. For the best results, refer to your manual for the appropriate rack position. What’s the difference between Light, Medium, and Dark? The Light, Medium, and Dark settings control the amount of time the food is toasted to achieve your desired results. 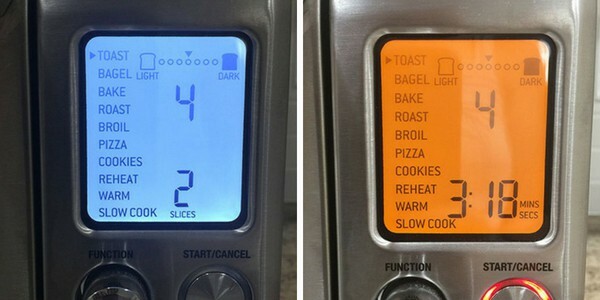 Most toaster ovens/countertop ovens with digital controls allow you to set the toasting level from light to dark along with the number of slices. The toaster oven will then automatically adjust the cooking time depending on your selections. These types of countertop ovens usually have a way to let them know if you are using frozen bread too. 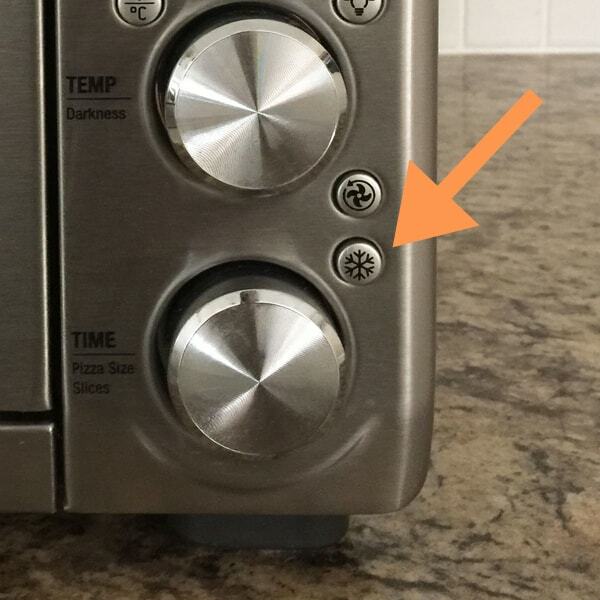 On the Breville Smart Oven Pro, it’s the snowflake button. Pressing it will add an additional 15 seconds per slice for defrosting. Like with the Bagel feature, we’ve been fairly happy with the Breville’s toast presets, though we have found Broiling works better for sourdough and other bread with a low sugar content. On a toaster oven with knobs or dial controls, you’ll need to manually set the temperature you want and the amount of time to toast. First, place your bread slices in the center of the cooking rack (refer to your manual for the correct rack placement). If your toaster oven has a functions dial, set it to Toast. Next, set the temperature. 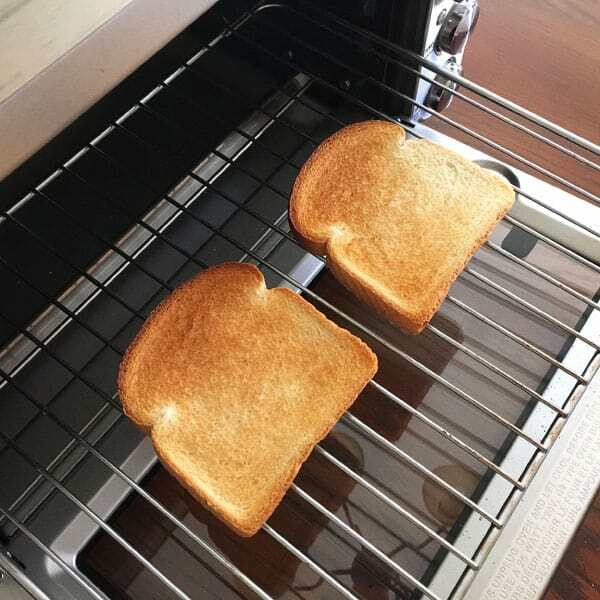 These types of toaster ovens usually recommend a high heat (like 450°F) but you should play around with the temperature settings to find your sweet spot. Lastly, set the timer. The exact time will depend on your tastes, type of bread, the number of slices, and your toaster oven. It could be as low as 2 minutes and 30 seconds or as high as 5 minutes. Instead of relying on those random Light, Medium and Dark marks on your timer take 5 minutes and make some toast. Grab your cell phone, open the clock app and switch it to the stopwatch. Place a slice of your favorite bread in the toaster oven. Adjust the settings to Toast, set the temperature to 450°F (or your preferred number) and the time dial to 4 or 5 minutes. After about 2 minutes and 30 seconds start watching the toast. As soon as the bread is as browned and toasted as you like, stop the stopwatch. Now you know exactly how long to toast your bread. You can even mark it on the toaster oven if you want. Can I Use The Broiler to Toast Bread? Yes, but you need to hang out and remember to flip the toast over. Also, since the heat is only coming from the top elements it might not toast or brown the bread evenly. Adjust your rack to the top position. Set the toaster oven to the Broil setting. Place your bread in the center of the rack and close the door. Broil the toast for 1 to 2 minutes, carefully flip the toast and broil for 1 to 2 minutes more. 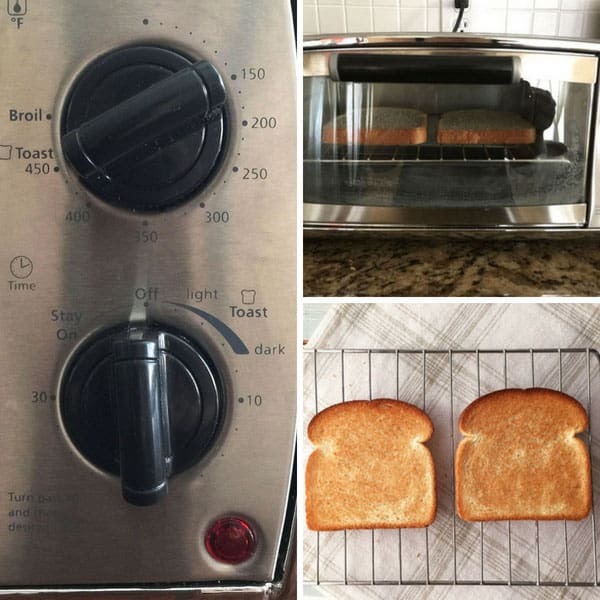 There you have it, everything you need to know about your basic toaster oven settings to get started! I know it might feel a little overwhelming at first. But once you get used to your little oven you’ll be cooking up all kinds of tasty treats and yummy meals. Start with something easy like these super addictive roasted sweet potato rounds, a baked potato or any toaster oven veggie recipe. If you want to give broiling and toasting a try check out this Eggplant Sandwich. Whatever you make, have fun! We have a cooks 6 slice toaster oven – also convection. Both top and bottom elements light on bake, Your site says the element will go off regulating the heat. Both elements go off and on at the same time. Any thoughts? This is our 2nd one (both did the same thing) and we’re thinking it’s just defective. Thanks! That is how most toaster ovens heat during the Bake cycle but I’m sure there are some that work differently too. 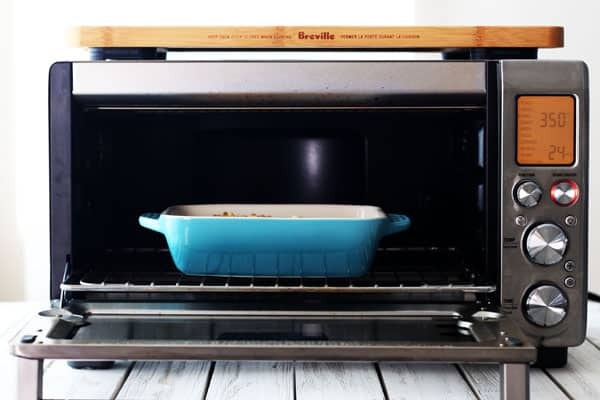 Your toaster oven might appear to have both of them on at the same time but they are probably not using the same wattage or power – usually, the bottom is stronger than the top. I couldn’t find the manual for your little oven online to see if the manufacturer gave any info on the heating during baking. It is entirely possible both elements are heating with the same amount of power. In that case, it’s more like the toast setting and will probably cook much faster than expected. If your food is turning out to your liking – I wouldn’t worry too much about it. If things aren’t going so well – I’d reach out to the manufacturer and see if they could offer insights/assistance to help you have a better experience using their product. I couldn’t find interior dimensions for your oven but something like this Chicago Metallic Non-Stick 4-Piece Toaster Oven Set might work. It’s got a small rack for cooking the protein, the rack fits into the cookie sheet or the roasting pan to catch any juices and liquids released during cooking. Nordic Ware has a bunch of toaster oven broiler pan sets too! I’m not a huge fan of the gold coating they use but the black rack is very sturdy – you can see it here. Would love know best way to make pizza bagels in a toaster oven without making the biggest mess. I get the idea that you need to put it right on the wires so the bottom will toast, but then cheese always falls off and makes a big mess on the bottom. For crispier bagels just toast them before topping and baking. I did a little searching on Amazon and it looks like even the largest toaster ovens/countertop ovens max out around 8-inches for the interior dimensions. The problem is those dimensions are usually only from the top to bottom, once you take into account the heating elements and the rack placement the available space gets a lot smaller. The only one that looks like it might have enough room is this Extra Large Oster Countertop Oven (https://www.amazon.com/dp/B00OXSR486/). I’d call Oster directly and ask before buying anything to make sure the pot you want to use will fit.